Hamlet is a 1948 British film adaptation of William Shakespeare's play Hamlet, adapted and directed by and starring Sir Laurence Olivier. Hamlet was Olivier's second film as director, and also the second of the three Shakespeare films that he directed (the 1936 As You Like It had starred Olivier, but had been directed by Paul Czinner). Hamlet was the first British film to win the Academy Award for Best Picture. It is also the first sound film of the play in English. A 1935 sound film adaptation, Khoon Ka Khoon, had been made in India and filmed in the Urdu language. Olivier's Hamlet is the Shakespeare film that has received the most prestigious accolades, winning the Academy Awards for Best Picture and Best Actor and the Golden Lion at the Venice Film Festival. However, it proved controversial among Shakespearean purists, who felt that Olivier had made too many alterations and excisions to the four-hour play by cutting nearly two hours' worth of content. Milton Shulman wrote in The Evening Standard "To some it will be one of the greatest films ever made, to others a deep disappointment. Laurence Olivier leaves no doubt that he is one of our greatest living actors...his liberties with the text, however, are sure to disturb many." The film follows the overall story of the play, but cuts nearly half the dialogue and leaves out two major characters. The action begins on the battlements of Elsinore where a sentry, Francisco (John Laurie), is relieved of his watch (and questioned if he has seen anything) by another sentry, Bernardo (Esmond Knight), who, with yet another sentry, Marcellus (Anthony Quayle), has twice previously seen the Ghost of King Hamlet. Marcellus then arrives with the sceptical Horatio (Norman Wooland), Prince Hamlet's friend. Suddenly, all three see the Ghost, and Horatio demands that the ghost speak. The ghost vanishes then, without a word. Inside the Great Hall of the castle, the court is celebrating the marriage of Gertrude (Eileen Herlie) and King Claudius (Basil Sydney); old King Hamlet has died apparently of an accidental snakebite, and his wife, Gertrude, has, within a month of the tragedy, married the late King's brother. Prince Hamlet (Laurence Olivier) sits alone, refusing to join in the celebration, despite the protests of the new King. When the court has left the Great Hall, Hamlet fumes over the hasty marriage, muttering to himself the words "and yet, within a month!" Soon, Horatio and the sentries enter telling Hamlet of the ghostly apparition of his father. Hamlet proceeds to investigate, and upon arriving on the battlements, sees the ghost. Noting that the ghost beckons him forward, Hamlet follows it up onto a tower, wherein it reveals its identity as the Ghost of Hamlet's father. He tells Hamlet that he was murdered, who did it, and how it was done. The audience then sees the murder re-enacted in a flashback as the ghost describes the deed – Claudius is seen pouring poison into the late King Hamlet's ear, thereby killing him. Hamlet does not at first accept this as the truth, and then prepares to feign madness, so as to test Claudius' conscience, without jumping to conclusions. This feigned insanity attracts the attention of Polonius (Felix Aylmer) who is completely convinced that Hamlet has gone mad. Polonius pushes this point with the King, claiming that it is derived from Hamlet's love for Ophelia (Jean Simmons), Polonius's daughter. Claudius, however, is not fully convinced, and has Polonius set up a meeting between Hamlet and Ophelia. Hamlet's "madness" is constant even in this exchange, and Claudius is convinced. Hamlet then hires a group of wandering stage performers, requesting that they enact the play The Murder of Gonzago for the king. However, Hamlet makes a few alterations to the play, so as to make it mirror the circumstances of the late King's murder. Claudius, unable to endure the play, calls out for light, and retires to his room. Hamlet is now convinced of Claudius' treachery. He finds Claudius alone, and has ample opportunity to kill the villain. However, at this time, Claudius is praying, and Hamlet does not seek to send him to heaven, so, he waits, and bides his time. He instead confronts Gertrude about the matter of his father's death and Claudius' treachery. During this confrontation, he hears a voice from the arras, and, believing that it was Claudius eavesdropping, plunges his dagger into the curtains. On discovering that he has in fact, killed the eavesdropping Polonius instead, Hamlet is only mildly upset, and he continues to confront his mother. He then sees the ghostly apparition of his father, and proceeds to converse with it (the Ghost is uncredited in the film, but is apparently voiced by Olivier himself). Gertrude, who cannot see the ghost, is now also convinced that Hamlet is mad. Hamlet is deported to England by Claudius, who has given orders for him to be killed once he reaches there. Fortunately, Hamlet's ship is attacked by pirates, and he is returned to Denmark. In his absence, however, Ophelia goes mad over Hamlet's rejection and the idea that her own sweetheart has killed her father, and she drowns, supposedly committing suicide. Laertes (Terence Morgan), Ophelia's brother, is driven to avenge her death, as well as his father's. Claudius and Laertes learn of Hamlet's return and prepare to have him killed. However, they plan to make it look like an accident. Claudius orders Laertes to challenge Hamlet to a duel, wherein Laertes will be given a poisoned blade that will kill with a bare touch. In case Laertes is unable to hit Hamlet, Claudius also prepares a poisoned drink. Basil Sydney as King Claudius. Claudius is the brother, and murderer of the late King Hamlet, and marries his widow only two months after the King's death. Eileen Herlie as Queen Gertrude. Gertrude, now married to Claudius, does not suspect foul play, and fears for the health of her son. A Scottish-American actress, Herlie's role in Hamlet was secured by arrangement with Sir Alexander Korda, and she would repeat it in the 1964 Broadway production starring Richard Burton. Laurence Olivier as Hamlet, Prince of Denmark and the voice of Hamlet's father's ghost. Hamlet is the conflicted son of the late King, who is now suspicious of his father's death. Olivier, considered by many to be the greatest actor of the 20th century, had played this role twice on stage in 1937, at the Old Vic Theatre and later at Elsinore Castle, the actual setting of the play. His 1948 film performance of the role was the only one of his to win him an Academy Award for Best Actor, despite three prior nominations, and five subsequent ones. Olivier, however, did receive several Honorary Oscars. Norman Wooland as Horatio. Horatio is Hamlet's level-headed friend. Wooland was a German-born British actor, who later played another companion to Olivier's character in Richard III. Felix Aylmer as Polonius, the Lord Chamberlain. Polonius is suspicious of Hamlet, and is convinced his insanity stems from the young prince's love for his daughter, Ophelia. Aylmer had worked with Olivier on his Henry Vas well as As You Like It. Terence Morgan as Laertes, Polonius' son. Laertes arrives in Denmark to discover his father killed by Hamlet and Ophelia, his sister, first driven mad and then to her own death. He vows vengeance against Hamlet. Morgan was a British actor, who joined the Old Vic company in 1948. Jean Simmons as Ophelia. Ophelia is the daughter of Polonius, and is driven mad by his death, as well as by Hamlet's rejection. Simmons' performance in this film won her a nomination for Best Supporting Actress at that year's Oscars. Prior to her death, she was the last surviving principal cast member (excluding extras). John Laurie as Francisco. Francisco is a weary sentry, who is relieved by Bernardo at the beginning of the film and never reappears. John Laurie appeared in all three of Olivier-directed Shakespeare films as well as in the 1936 film As You Like It, which starred Olivier. Esmond Knight as Bernardo (sometimes spelled Barnardo). Bernardo is a sentry who is sent to relieve Francisco; however, in the process he sees the apparition of King Hamlet. He and Marcellus have seen it twice before, but have found it difficult to convince Horatio, until Horatio sees it himself. Knight appeared in all three of Olivier's Shakespearean films, as well as The Prince and the Showgirl. Anthony Quayle as Marcellus. Marcellus is a soldier stationed at Elsinore. He and Bernardo have already seen the ghost. Niall MacGinnis as 'Sea Captain'. The Sea Captain (a character invented for the film) is the captain of the ship that Hamlet sets out on for England. The captain's lines, though, are from the original play, where they are spoken by a sailor. Christopher Lee, later known for horror films, has an uncredited role as a spear carrier with no spoken lines. Harcourt Williams as the First Player. The First Player is enlisted by Hamlet to alter their play to mirror his suspicions about Claudius. Harcourt Williams had appeared in Olivier's film of Henry V prior to this. Patrick Troughton as the Player King. The Player King enacts a mimed play that echoes Claudius' treachery. Tony Tarver as the Player Queen. The Player Queen plays the King's wife onstage; in Olivier's film she is a satire of Gertrude, intended to catch the conscience of Claudius. Peter Cushing as Osric. Osric is a foppish courtier who referees the duel between Hamlet and Laertes. In later film versions of the play, such as the 1969 one with Nicol Williamson, Osric would be made more openly "swishy". Stanley Holloway as Gravedigger. (The second Gravedigger of the play is omitted.) The Gravedigger is digging Ophelia's grave when Hamlet and Horatio come across him. Russell Thorndike as the Priest. The Priest leads the funeral ceremony for Ophelia. Eileen Herlie, who plays Hamlet's mother, was 28 years old when the movie was filmed. Olivier, who plays her son, was 40. Olivier played the voice of the Ghost himself by recording the dialogue and playing it back at a reduced speed, giving it a haunted, other-worldly quality. However, for many years it was assumed, even in film reference books, that John Gielgud had played the voice of the Ghost. Gielgud would go on to play this role in three later productions – the 1964 film and stage versions of Richard Burton's Hamlet, the 1970 telecast of the Hallmark Hall of Fame production starring Richard Chamberlain, and a 1992 radio production starring Kenneth Branagh. The cinematography, by Desmond Dickinson, makes use of the deep focus photography previously popularised in films directed by William Wyler and Orson Welles. The music was composed by William Walton and, next to his score for Olivier's 1944 film Henry V, has become his most celebrated film score. The film's opening with Olivier's voiceover of his own interpretation of the play, was criticised as reductive: "This is the tragedy of a man who could not make up his mind." Olivier excised the "political" elements of the play (entirely cutting Fortinbras, Rosencrantz and Guildenstern) in favour of an intensely psychological performance, partly to save time. Olivier himself stated that "one great whacking cut had to be made", and the cut he chose to make was the omission of Rosencrantz and Guildenstern. This was not much criticised at first, but later critics did take more notice of it, especially after shorter productions of Hamlet that did not leave out these characters were presented on television. John Gielgud took much the same approach years later by also leaving out Rosencrantz, Guildenstern, and Fortinbras from his 1951 radio production of the play, broadcast on the program Theatre Guild on the Air. Gielgud also followed the lead of Olivier's film version by giving the final lines of the play to Horatio instead of to Fortinbras. Olivier also played up the Oedipal overtones of the play by having Hamlet kiss his mother lovingly on the lips several times during the film. Film scholar Jack Jorgens has commented that "Hamlet's scenes with the Queen in her low-cut gowns are virtually love scenes." In contrast, Jean Simmons' Ophelia is destroyed by Hamlet's treatment of her in the nunnery scene. According to J. Lawrence Guntner, the style of the film owes much to German Expressionism and to film noir: the cavernous sets featuring narrow winding stairwells correspond to the labyrinths of Hamlet's psyche. The 1948 Hamlet was the only film in which the leading actor had directed himself to an Oscar-winning performance, until 1998, when Roberto Benigni directed himself to an Oscar in Life Is Beautiful. Olivier is also the only actor to win an Oscar for a Shakespearean role. Hamlet is the only film to have won both the Golden Lion and the Academy Award for Best Picture. It is also the first non-American film to win the Best Picture Academy Award. In the past, the 1948 film was often considered the definitive cinematic rendition of Hamlet. Over the years, however, it has lost some of its status, especially in comparison to Olivier's versions of Henry V and Richard III. This is primarily because Olivier, according to some critics, overemphasised Hamlet's Oedipal fixation on his mother, and because Rosencrantz and Guildenstern, two of the most important supporting characters in the play, were completely omitted from this film version, robbing the film of what could have been some of its best comedic moments. The fact that Rosencrantz and Guildernstern had been included in the 1969 Nicol Williamson – Tony Richardson Hamlet and the 1990 Mel Gibson/Franco Zeffirelli version, both of which are shorter than Olivier's, did not help Olivier's rationale that the play needed such drastic cuts to work on screen. In contrast, Kenneth Branagh's 1996 film version of the complete Hamlet included everything that Olivier had omitted. even if you feel that certain scenes should be done differently, when has the rest of the play been done so well? Whatever the omissions, the mutilations, the mistakes, this is very likely the most exciting and most alive production of Hamlet you will ever see on the screen. It's never dull, and if characters such as Fortinbras and Rosencrantz and Guildenstern have been sacrificed, it's remarkable how little they are missed. In fact Time magazine wrote in 1948: "A man who can do what Laurence Olivier is doing for Shakespeare is certainly among the more valuable men of his time." 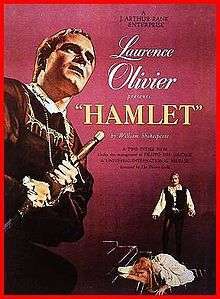 Hamlet was the second of Olivier's Shakespeare films to be telecast on American commercial network television – the first was Richard III, which was given an afternoon rather than a prime-time showing by NBC on 11 March 1956, the same day that it premiered in cinemas in the US The American Broadcasting Company gave the Olivier Hamlet a prime time showing in December 1956 but, like many theatrical films shown on television during that era, it was split into two 90-minute halves and telecast over a period of two weeks, rather than being shown complete on one evening. Only a month previously, MGM's 1939 film The Wizard of Oz had had its first television showing – on CBS – and, unlike Hamlet, had been shown complete in one evening. In North America, Olivier's Hamlet has been released on DVD as part of The Criterion Collection, which has also released his film versions of Henry V and Richard III on DVD. The film has been released on Blu-ray Disc in the UK, however this disc is Region B locked and will not work in most American players. ↑ Tanitch, Robert. (1985) Olivier. Abbeville Press. ↑ "Hamlet". The New York Times. Retrieved 20 December 2008. ↑ "dOc DVD Review: Laurence Olivier's Hamlet (1948)". Digitallyobsessed.com. 6 May 2008. Retrieved 7 October 2012. ↑ Kael, Pauline (1991) 5001 Nights at the Movies Henry Holt. ISBN 0805013679. ↑ "Cinema: Olivier's Hamlet". Time. June 28, 1948. Retrieved 4 May 2010.